I was lucky enough to be asked to come and demonstrate Google Glass at Venturefest Yorkshire 2014 last week month (time ran away!) (representing myself, a Glass developer). 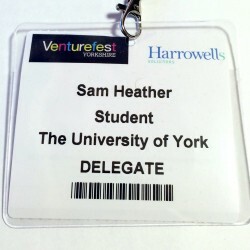 Venturefest is a free one-day event showcasing the latest technologies and businesses, and it’s very popular with entrepreneurs. As Glass hasn’t become publicly available yet, this was an exciting opportunity to demonstrate Glass to some of the UK’s most innovative and creative minds, many of whom haven’t yet had the chance to experiment with any wearable technology in the past. My goal was to demonstrate it’s potential and to spark an interest or idea that may lead them to start developing for wearable devices – development which just isn’t mainstream in the UK yet. So, bright and early on the 14th of March, I headed out to the York Racecourse where the event was been held and setup my demo – simply Glass, a power cable to re-charge it at every possible opportunity and a laptop showing videos of Glass been used from the Glass YouTube channel. From 9AM through 1PM, I was constantly busy – it was definitely a very popular device. So, what was the feedback? The first thing I noticed was that nobody seemed to know how to use it! This is different to the US where someone asks you to try it and with the smallest of hints they’re away and navigating through features. Perhaps this is down to the additional media coverage it’s had in the US compared to the UK, but I was still surprised at how few people had investigated it in the year it’s been about, bearing in mind it seems to be the future. The general feedback was that people were extremely impressed with Glass – specifically, a number of people commented on how unobtrusive it was when it was switched off (you can see right through it) and on how incredible Google Now on Glass was – two distinctive questions that it correctly answered were “What’s the capacity of the Riverside Stadium?” and “What is the nickname of the Bank of England?”. One specific piece of feedback I did keep getting was that “It would be really useful as an Augmented Reality device for my …”, which is an area that, up until now, I haven’t thought hugely about. It does seem obvious though, as it’s a much more natural device for augmenting your vision than, for example, your phone, which you must constantly hold up in-front of your face. All in all, I think it went well and that people enjoyed the experience. Fingers crossed that I managed to persuade a few more people that wearable technology and Google Glass really are a viable future. This entry was posted in Computer Science, Google Glass, York University CS Student Blogs and tagged demo, demonstration, glass, google glass, venturefest, york on April 22, 2014 by Sam.